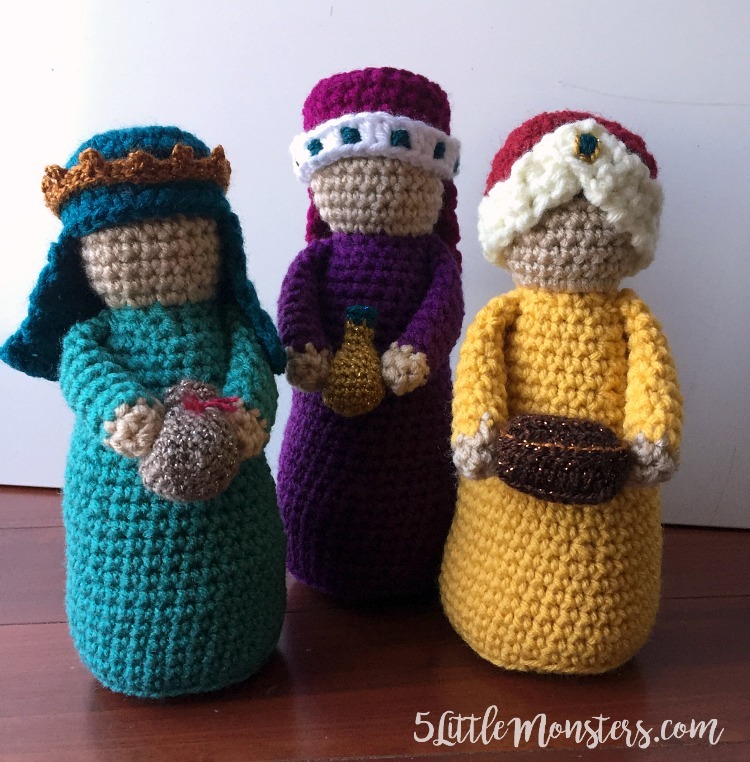 Over a year ago, in Novmber of 2015, I posted the pattern for my crocheted Nativity set. 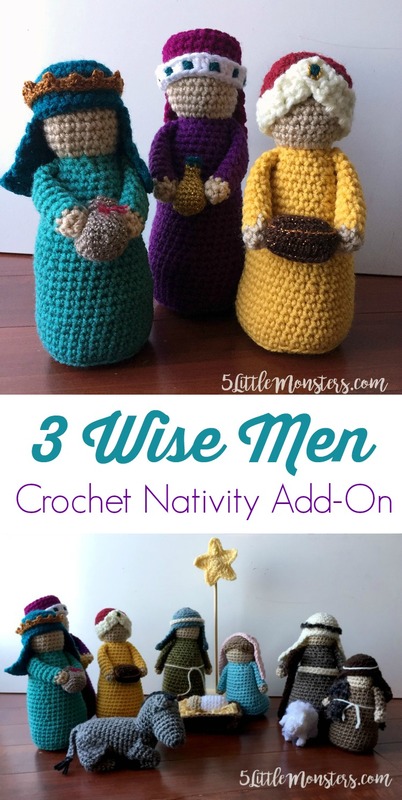 From that time I had planned to make a set of Wise Men to go along with it. Originally I hoped to make them that year and publish the pattern before Christmas but with the craziness of that time of year it didn't happen. 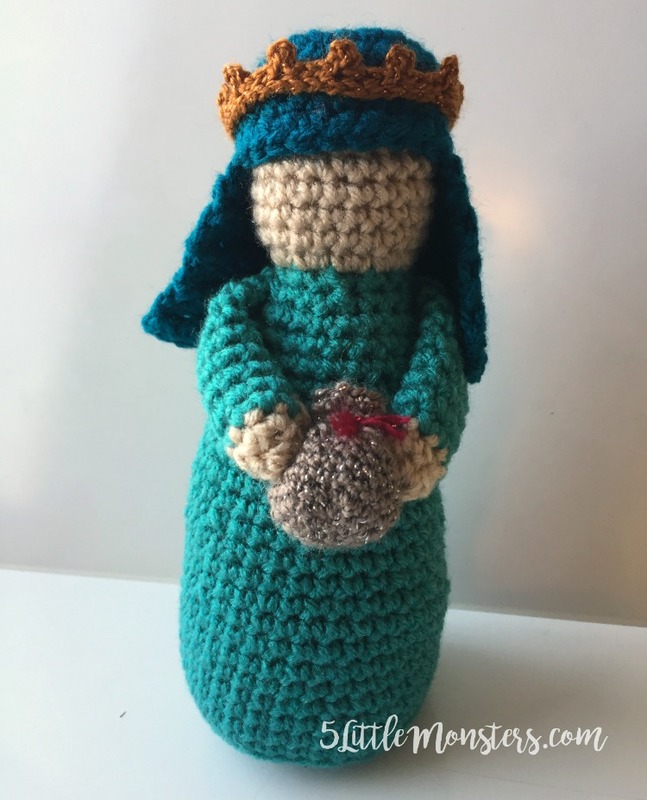 Then I thought maybe I would try to get it done in July for a Christmas in July type post which would give people plenty of time to work on it for Christmas, but I had a baby in July so a lot of things that I had planned didn't happen. Then I thought I would get it done before Christmas for sure. But once again I didn't get them done. 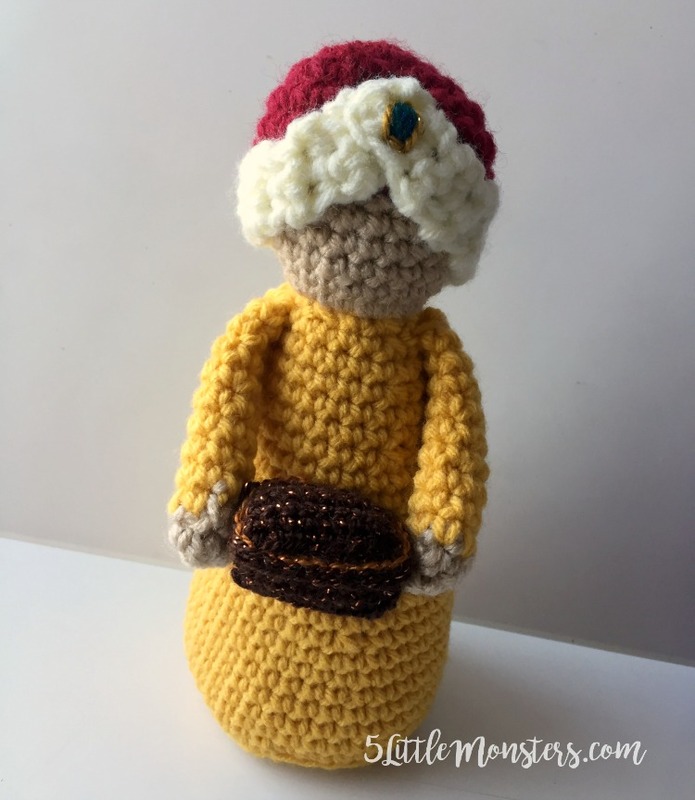 I thought about waiting to finish them and post the pattern until closer to Christmas but then I realized that I obviously have a problem with getting them done by the time I plan to so I thought it would be best if I just got them done now and posted the pattern. 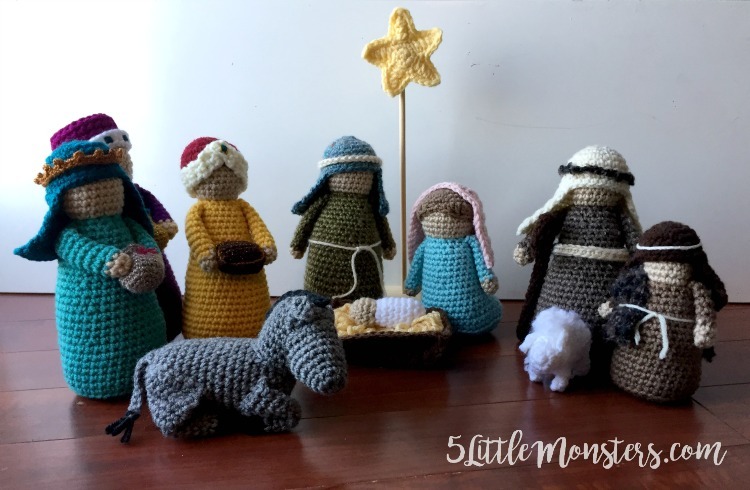 It may seem like kind of a wierd time to publish a Christmas pattern but I figured it was either get it up now or it might never get done. Besides, today actually happens to be 3 Kings Day so in a way it works. Also, now anyone who wants to make a nativity set for Chirstmas has almost a whole year to get them done. 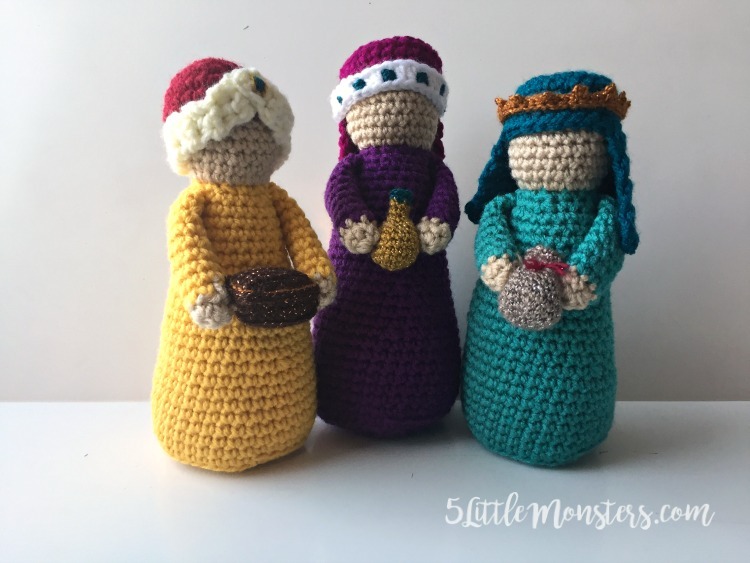 The bodies of the wise men are made almost identical to Joseph and the shepherd, the only difference is that I made the purple one a little taller so that they weren't all three exactly the same size. I also used colors that were a lot brighter, kind of jewel tones, for a more royal look. I made three different headresses and gifts for each of them to carry. 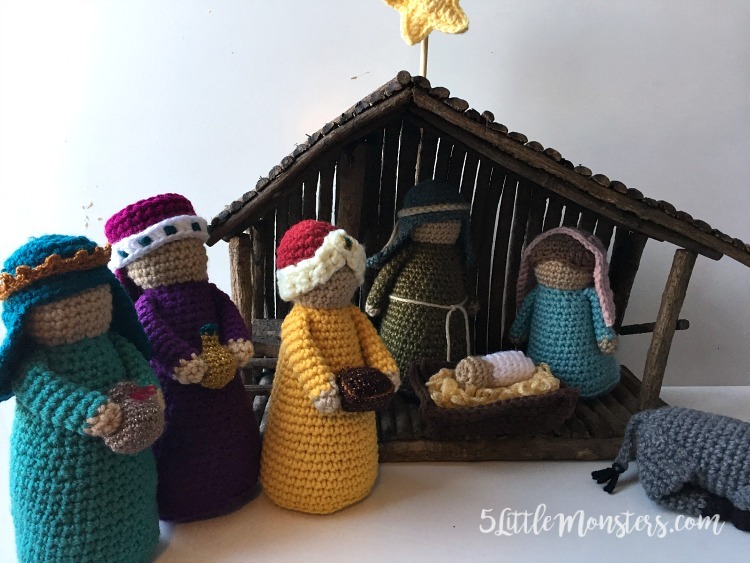 The wise men and the headdresses are all made with worsted weight yarn. I used a couple different brands, most of it is Red Heart Super Saver, with some Lion Brand and Big Twist Brand from JoAnn. For the gifts and small accents on the headdresses I felt like I wanted to use a thinner yarn so that they could be make a little more delicate, less clunky than they would have been with a worsted weight yarn. I happened to have a package of Lion Brand BonBons in the Party colorway that I had picked up one time because they were on clearance and I figured I would find some way to use them. They worked perfectly because the colors were perfect for what I wanted and they have a sparkly thread through them which worked well for the things I was making. I believe the weight category for these particular ones was 2, if you can't find the bonbons Vanna's glamour might actually be the same yarn or it is at least very similar. The nice thing about the bonbons was several colors in small amounts. Wrap the cream band around just under the back edge of the burgundy piece and around to meet in the middle of the front, pulling the two ends up to meet and overlap in the front. 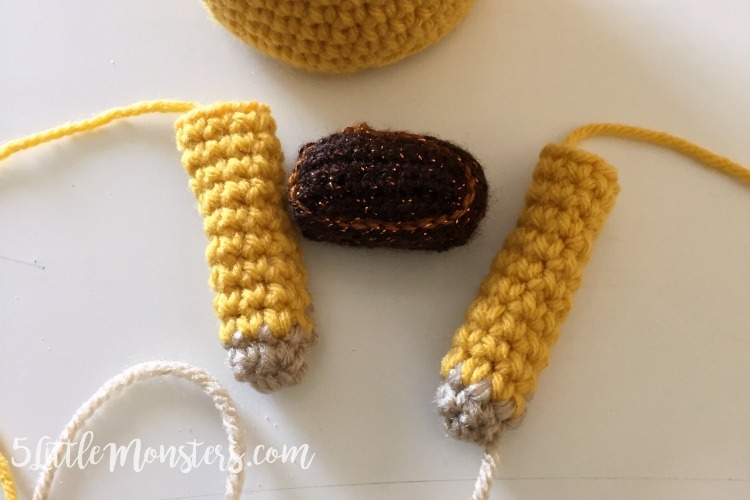 Then using some of the BonBon yarn (I used a blueish color) make a couple of stitches of in that color then stitch around in gold to make a jewel. Using the long tail left on one of the hands stitch from that hand, through the gift, and into the other hand then back through the gift and into the first hand. finish off and cut yarn. 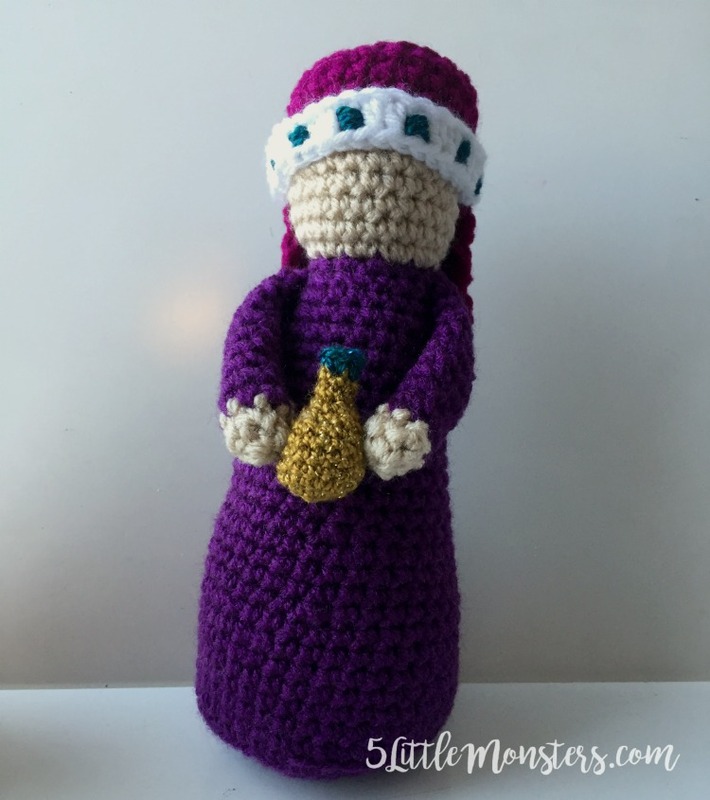 Make the body and arms exactly the same as the gold wise man using Jade yarn or desired color. with contrasting color weave between rows 10 and 11, pull to cinch and tie to secure. place headress on head with white band around the bottom and stitch in place, with bonbon yarn stitch around each third stitch 3-4 times. finish off and sew into hands in the same way as the previous two. I'm totally going to try all of these patterns . . . :) Thanks for offering them so generously for free. thankyou so much I will try to get them done soon!